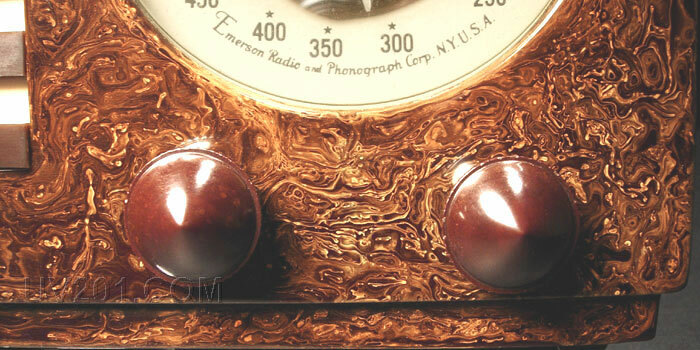 For the 1940 model year, Emerson commissioned the noted industrial designer, Norman Bel Geddes, to design a series of radios, and the Aristocrat and Patriot models were the result. 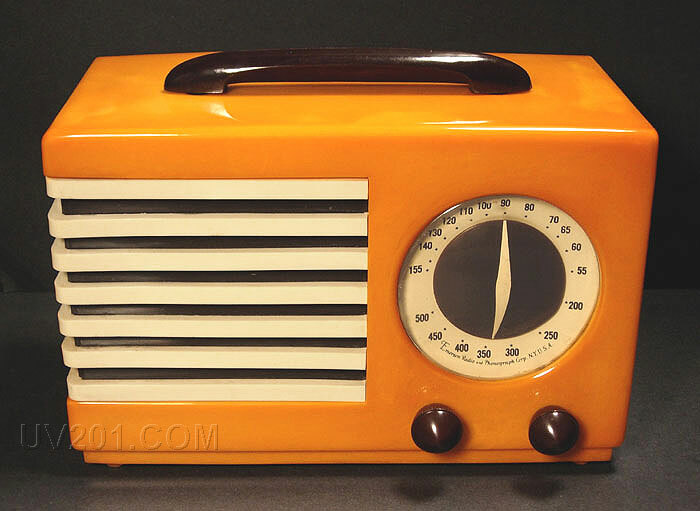 All of these radios had Catalin cabinets, with two-color grill inserts, spring-loaded handles, and all had the same model number (FC-400). The Patriots came in various combinations of red, white, and blue. 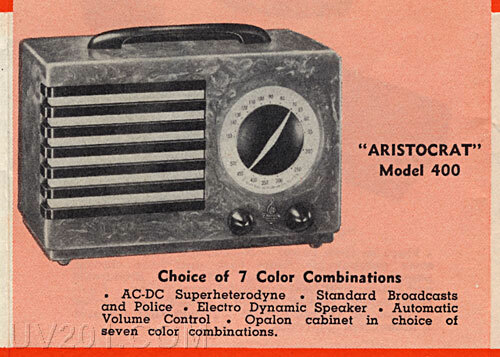 Emerson advertised the Aristocrat model as being available in four cabinet colors, but there may actually have been five. 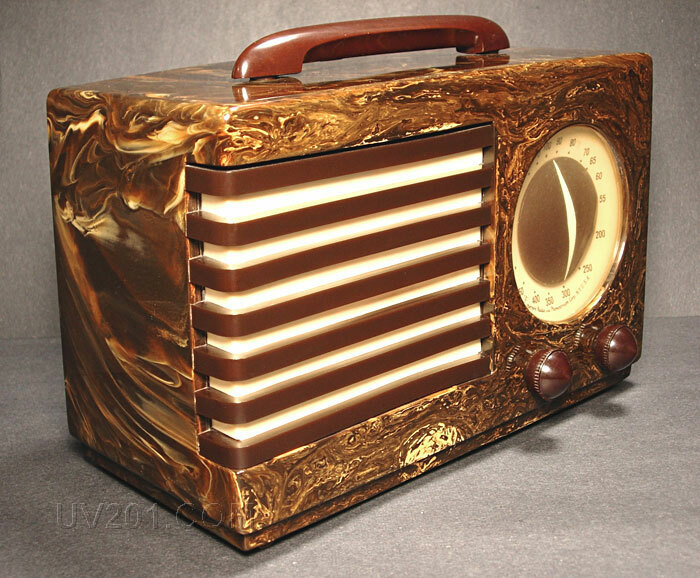 They all had a brown and white grill, a brown and white dial design, and brown Bakelite bullet knobs and handles. The first, and most common cabinet color was white (actually, a clear base color with white swirl). With age, these have turned yellow or orange. These were advertised as being "natural onyx". 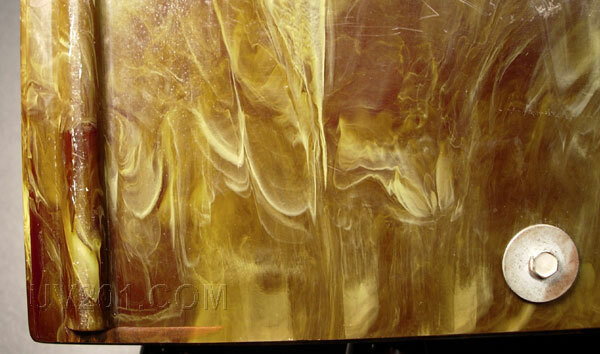 The second color was green, which they called "Brazilian onyx". It was a clear green base color with varying amounts of white (and sometimes brown) swirl. The examples that had a large amount of white mixed in with the green are now yellow, and can be difficult to distinguish from the white ones. Examples with lesser amounts of white have remained distinctly green. 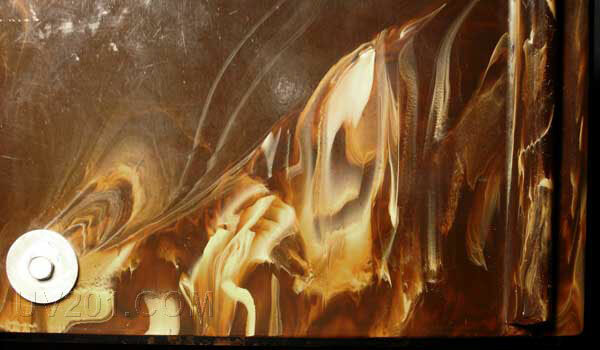 The third color was walnut (brown), which was called "Circassian onyx" by Emerson. There were actually two distinct color variants. One was a rich chocolate brown base, nearly opaque, with white swirl. 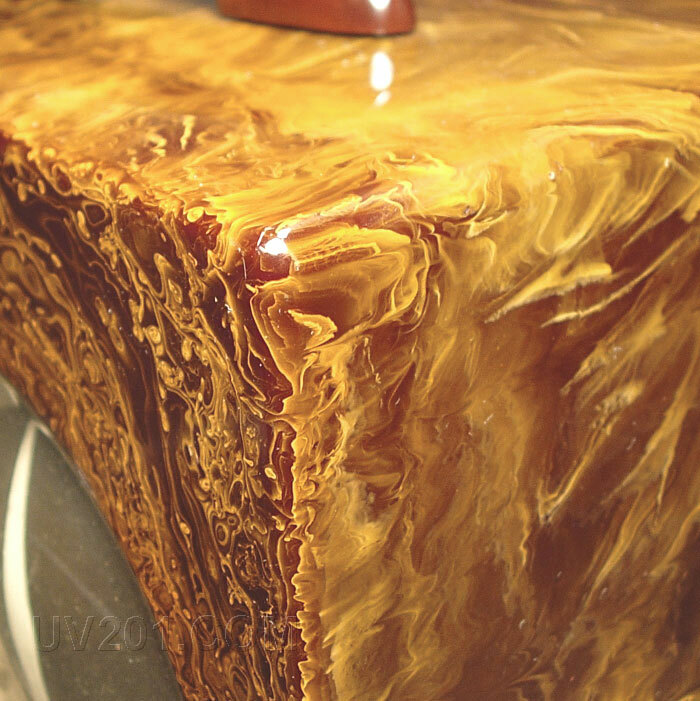 With age, the base color on these has remained brown, and the white swirl is now yellow. The other variant was actually a translucent amber base color, with white swirl. In its aged condition, this appears as a deep maroon shade with yellow swirl, though most people consider it to be brown. It was not especially attractive when new, but is one color that has greatly improved with age. There was apparently also a black version, which they called "ebony onyx". I have never seen one of these, but they may have used different trim colors than the rest of the Aristocrats. The Aristocrats, and their patriotic cousins, share several major flaws. Most critical was shrinkage of the Catalin cabinet. The handles did not shrink, however, and the conflict often led to a broken handle or case. The best outcome was one in which the handle jammed in the "up" position, relieving the stress to some extent. The grill and dial pointer (a very thin translucent disk) were also prone to warping. The next three photos show a brown Aristocrat. The final four pictures show an amber Aristocrat. 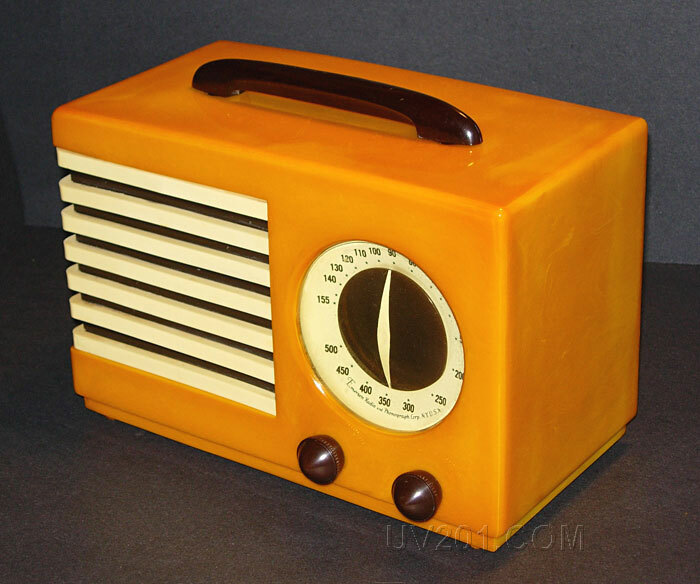 The photos showing the bottoms of the two radios illustrate the difference between the brown and amber variants. The amount of oxidation is always less on the bottom, and they give a better idea of what the radios looked like when new. 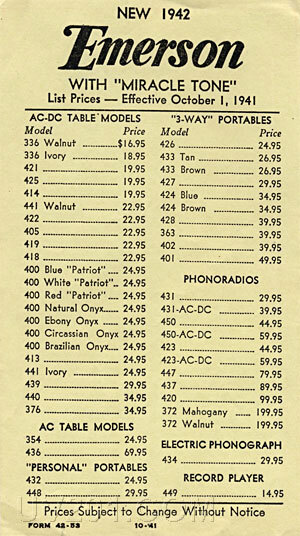 Above is a scan from a 1941 Emerson brochure showing the Aristocrat, and below is a price list from the same year. Interestingly, they group the Patriot models together with the Aristocrats, and they are three of the seven color combinations that are alluded to in the brochure.